Jamaica Bay is a large body of water and salt marsh area covering 26 miles on the south shore of Long Island. John F. Kennedy Airport borders the bay on it's eastern end, and the bay it's self separates the peninsula of the Rockaways from the main part of Long Island. The western end of the bay is open to the Atlantic Ocean at the Rockaway Inlet. The Gateway National Park covers a large area of the bay, and offers recreational opportunities including fishing, hiking, boating, bird watching, basketball, softball, football, soccer, horseback riding, and jogging. The bird watching is fantastic here, and one may see over 200 species of birds throughout the year. Thousands of ducks and geese stop over here during the fall migration. This is a very important stop along the Atlantic Flyway. Jamaica Bay ranges in depth from 3 to 12 feet, but has been dredged for navigation and can be up to 50 feet deep in spots, but on average depth is less than 10 feet deep. Due to the shallow nature of the bay it warms very quickly in the spring and is a magnet to all species of fish and birds alike. Some of the fish you may encounter on a trip to the bay include Fluke, Stripers, Weakfish, Bluefish, Bonito, Spanish Mackerel, Tautog, Seabass, False Albacore and Skipjack Tuna. Captain Joe Bud Russo May 21, 2003 Captain Joe Bud Russo was fishing in Jamaica Bay. He was using 12 pound test line and was using bunker for bait when he caught this beautiful 10.64 pound weak fish. Captain Russo has been a bayman since the early 70's. He has lived all his life in Howard Beach, and has a 25' Express Fisherman. His specialty is taking out fly fisherman and light line anglers. Fishing for weaks and stripers in the spring and summer. Then fishing for tautog and seabass in the fall. 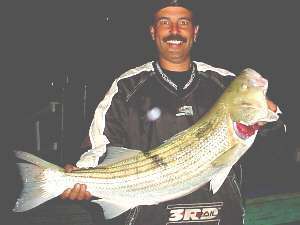 The current state record weak fish was caught by Dennis Rooney, of Seaford, NY on October 11, 1984. This incredible fish weighed 19.2 pounds. 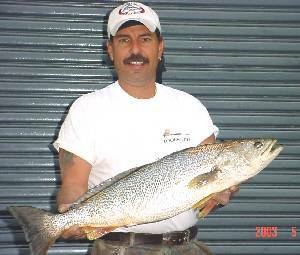 Weakfish are starting to make a come back and are being caught more often by recreational fisherman. Fresh bunker makes a great bait, because he also caught this 24 pound striper as well. There were lots of blue fish mixed in with the weak fish and stripers so it was necessary to use a small wire leader. That 12 pound test line is no match for the teeth of a blue fish and tying on hooks is not as much fun as catching fish. April 18, 2004 Rene Russo was fishing with her father in Jamaica Bay. 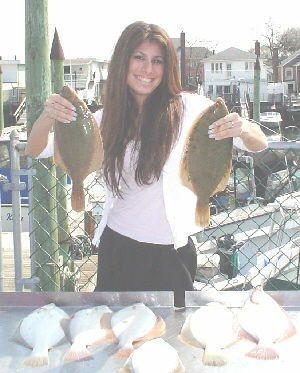 They ended up with a fine catch of flounder up to 2 1/4 lbs. The baits of choice this day were sandworms and mussels. Rene beat up on her father Joey Bud, she had 7 fish and he had 5. A great morning for all in Jamaica Bay on the top of the tide. Things will only get better here for the next few weeks with the arrival of the Blues, Stripers, and Weakfish. 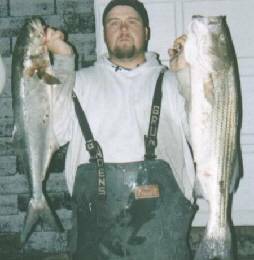 The date was November 26th, 2002 Larry Seaman 3rd from Rosedale N.Y. was fishing in the back bay area of Jamaica Bay where he caught these two late season trophies. A very nice 12 lb Blue Fish and an 18 lb Striped Bass that both took live herrring fished in 18 foot of water. What makes these two fish so impressive is the fact that they were caught so late into the season. The date was June 11, 2005. The place was Jamaica Bay. Michael Redmond was fishing at Breezy Point aboard the Irish Mist. He had snagged a bunker and while reeling it in this big 40 inch striped bass decided to make lunch out of it. The big striper soon learned that there is no such thing as a free lunch. 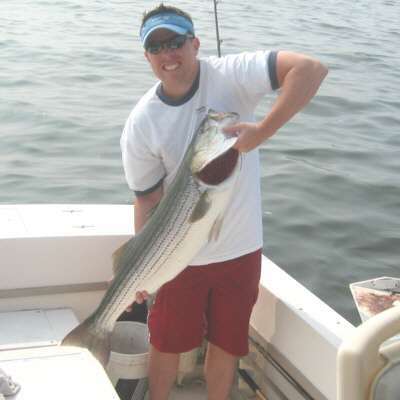 A short while later Mike was able to catch another striper which could have been his twin brother. Big striped bass love fresh bunker be it whole or chunked.